Nurse practitioners should do primary care on their own. 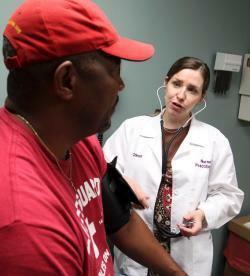 Colleen Gearhart, a nurse practitioner, checks the blood pressure of truck driver Mike Armstrong at a truck stop in Lodi, Ohio, in 2012. As of early April, you can walk into Walgreens in 18 states (plus D.C.), and along with a gallon of skim milk, a pair of photo mugs, a six-pack of toilet paper, and a flu shot, you can meet your new primary care provider, get your cholesterol checked, pick up your statin, and schedule a return visit. That primary care provider will not be a physician but a nurse practitioner (or a physician assistant, but that’s for another article). Those states, and now Walgreens, have recognized that nurse practitioners can handle a lot more than antibiotics for urinary tract infections: They can practice primary care just fine without physician oversight. And it’s a pretty smart move. Lagging behind are the other 32 states (this map lays it out), in which nurse practitioners are supervised to varying degrees by physicians, the scope of their practice restricted by laws that vary from state to state. In some states, nurse practitioners can’t enroll a patient in hospice, order a wheelchair, or prescribe certain medicines without a doctor’s signature. This is true even when it’s impractical geographically and financially, not to mention belittling. Nurse practitioners in a number of states, including Connecticut, Nevada, and West Virginia, are currently pushing for legislation for the right to practice independently and improve access to care. The nurse practitioners I’ve worked with as colleagues (I’m a primary care doctor, and I’ve practiced in clinics in Baltimore, New York, and Connecticut), and those who have taken care of me have been pretty awesome. When I was pregnant, I saw a middle-aged lanky nurse midwife who had a wry and down-to-earth sense of humor. He didn’t exude that sense of impatience that you get with so many doctors, that feeling that you’re holding him up from something more important. When I have questions about my very old patients, many of whom have dementia complicated by agitation or insomnia and who are not responsive to my usual bag of tricks, my go-to person is not a psychiatrist—she’s a gerontological nurse practitioner. So I was surprised when some of the most open-minded doctors I know hesitated before offering their take on the issue. Most echoed some of the concerns of the major physicians’ organizations: If collaboration with a physician becomes optional, will nurse practitioners know when to ask for help? And if primary care doctors need to attend four years of medical school and three of residency, can just three years of nurse practitioner postgraduate training create competent clinicians? But making a head-to-head comparison is tricky. Unlike the broader and basic science-heavy education of medical students, nurse practitioner students (many already having a few years of nursing experience) get practical right away and select a specialty— such as pediatrics, geriatrics, anesthesia, family, or midwifery—immediately upon beginning their training. During the corresponding years, medical students are studying subjects like embryology and biochemistry and learning the basics of how to talk to patients. Once nurse practitioners graduate, some opt for a year of additional training in a nurse practitioner residency program. (Newly minted doctors at that point will have chosen a residency specialty and will embark on at least three more years of training.) A few more years in training and nurse practitioners can earn a doctorate in clinical nursing—a DNP, which the Institute of Medicine report recommends for all advanced-practice nurses as of 2015. Meanwhile, medical training is getting a makeover, so the difference between nurse practitioners and doctors—at least in terms of years of training—is lessening. The 100-year-old paradigm is on the chopping block in many medical schools, and some schools and hospitals are already cutting the length of med school and residency training. (Let’s not even get into the outdated prerequisites for med school. Suffice it to say that I learned more about caring for patients by reading Chekhov than studying organic chemistry.) According to Ezekiel Emanuel, doctors’ training could be shortened by about 30 percent. Medical-school graduates of six-year training programs (which collapse the usual eight years of college and medical school into six) don’t do any worse on board exams; some schools already offer a three-year track. For internal medicine residency, Emanuel argues that three years is unnecessary; many programs have long offered two-year “short-track” options for residents eager to jump into a specialty, so why should training for primary care be any different? In my primary care residency, I spent many months on inpatient and intensive care unit rotations. This made more sense in the mid-1990s, when most primary care doctors still rounded on their own hospitalized patients. Nowadays, with hospitalists running many of the inpatient wards, many primary care physicians are becoming almost exclusively outpatient. The Institute of Medicine report highlights a number of studies that show that nurse practitioners provide as good care with as good outcomes as primary care physicians, along with high rates of patient satisfaction. In one of the most-cited studies, 1,316 mostly Hispanic patients were randomly assigned to see either doctors or nurse practitioners, and the outcomes of patients with diabetes and asthma were about the same. But the trial only lasted six months, which is a pretty short period of time in primary care for drawing conclusions about disease management and the patient-provider relationship. Whether you can extrapolate these findings to patients of different ages and backgrounds and to all of the chronic conditions that surface in primary care (and Walgreens) remains unclear. Primary care is not an easy field to master; the breadth and depth of knowledge is vast, unlike the narrower world of the shoulder specialist, who only sees patients with shoulder problems. Sure, every now and then there’s the glamour of cracking a diagnostic mystery case, the chance to dredge up some obscure and critical fact buried in our overloaded brains, but most of the time it’s like this: We talk. We listen. (Hopefully, we listen more than we talk.) We treat common illnesses and try to prevent chronic ones. We learn about where our patients live, what they eat, who they talk to, how they get around. We listen to the patient whose marriage is on the rocks and relate this to her elevated blood pressure. We coordinate care and help devise a plan when multiple specialists are giving different and sometimes contradictory recommendations. We make a lot of phone calls and answer a gazillion emails. When we’re not sure about something, we look it up, or knock on a colleague’s door, or call across town or across the country. And because primary care is all of these things, an ever-evolving conglomeration of medical knowledge and systems and empathy and integrity and creativity in problem-solving, this is precisely why it’s good to mix it up and reap the benefits of some nurse practitioner-doctor hybrid vigor. It’s time to unlock the gates to the primary care club. There will be plenty of patients for everyone.